We are a Dry Cleaner and Laundromat located in Beverly Massachusetts. 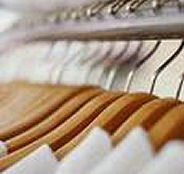 We strive to provide the best possible cleaning solutions for your everyday or important clothing articles. We take pride in delivering fast dependable service and continue to upgrade our equipment to assist you. We have recently installed new washers and dryers in our Laundromat and continue to deliver dependable service for our "Fluff and Fold". We have installed a new boiler and are adding new dry cleaning systems. If you need to do your laundry, visit us or drop it off for us to do for you. If you wish to stay and wait, bring your laptop or pda and use our free WiFi connection to surf the internet or catch up on your email! Visit our Specials page to print weekly money saving coupons. Do not have time to get to Flair during our hours? We are here 24 hours a day with our VIP Drop Off Service!